Due to some technical difficulties, the July issue of AVENUE magazine was a little late. 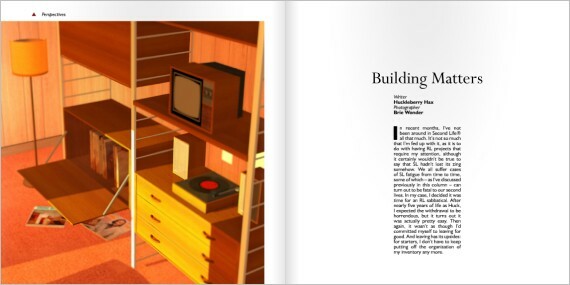 Here's my column, and this month photography is by Brie Wonder, who is one of my very favourite SL photographers. Brie's pictures are of my very own - never released - furniture range that I talk about in the column. Incidentally, this month's issue runs a feature - STAND4LOVE - with photography from one of my other all-time SL favourites - Paola Tauber. Well worth checking out. In recent months, I’ve not been around in Second Life® all that much. It’s not so much that I’m fed up with it, as it is to do with having RL projects that require my attention, although it certainly wouldn’t be true to say that SL hadn’t lost its zing somehow. We all suffer cases of SL fatigue from time to time, some of which – as I’ve discussed previously in this column – can turn out to be fatal to our second lives. In my case, I decided it was time for an RL sabbatical. After nearly five years of life as Huck, I expected the withdrawal to be horrendous, but it turns out it was actually pretty easy. Then again, it wasn’t as though I’d committed myself to leaving for good. And leaving has its upsides: for starters, I don’t have to keep putting off the organisation of my inventory any more. Of course I miss the people; of course I miss all those regular events: these, after all, were the things by which my SL was defined; it was the fabric of my virtual universe. Life’s old tapestries fold all too easily into boxes if new occupations tumble upon their space, however. Be they physical or digital, past times are past times – it’s not important to the brain the medium in which social connections took place – and we’re used to moving on. I made a book of pictures at the end of my five year run as Huck (you can see it for yourself at http://issuu.com/huckleberryhax/docs/five) and largely this has served when the mild urge to reconnect to those times has asserted itself. What’s surprised me, however, is just how significantly I miss building. Never really, a mainstay of my SL – more of a side-line; something I dabbled in from time to time – I didn’t for one moment assume that this would feature at all prominently in any tug back towards the virtual world. Don’t get me wrong: when I was in the mood to build, I could do it for hours and barely notice that the time was passing. I built things from that post-war period when the future we now worry in was gazed upon as a luxury time of atomic rockets and robot servants and flying cars: 60s and 70s artefacts such as Danish Modern furniture, teak-veneered electronics and concrete buildings with angles that seemed determined to defy nature in every manner possible. But this celebration of the childhood memories and fantasies of Generation X was more about nostalgic play than it was about any determined effort to make and sell retro-futurism merchandise. The grand opening of my Second Life shop was always just around the corner because the small business of actually building my Second Life shop was something I was just too lazy to do. I never bothered learning how to make my own sculpties, buying off-the-shelf blanks when I needed one for furniture I was building, because getting into third party software was just too much like hard work. And there was about as much chance of me learning how to design mesh, once I’d seen the user interface for Blender, as there was me spending the several weeks it would take me to sort my aforementioned inventory into neatly categorised folders. Basically, I built stuff for occasional, therapeutic fun. And nothing more than that. Yet, bizarrely, building is one of the things I miss most of all about SL right now. Building, after all, wasn’t a set of people or a place belonging to a time now over; building was something I did – albeit only occasionally – and did throughout my entire SL. Many of the other things I did whilst I was inworld, like writing poems and stories, I actually did alongside it and can continue to do now; building, however, is an SL-only activity. Yes, I know I could learn 3D modelling in an external application, but given the amount of commitment to such paraphernalia I indicated earlier, do you honestly think this likely? One of the things I loved about building was the keen eye it gave me for potential textures in the real world. The sheer joy at finding a texture that both offered a good angle and looked like it could be made seamless without too much effort was a difficult phenomenon to relate to those unacquainted with its quality. Some 1970s sky blue tiles between two shop fronts which had just been revealed by a large patch of plaster falling off. A 40 year old wallpaper in a beach shop in Normandy. An avocado-on-white lattice design on a ledge in the gents’ toilets of a conference centre that used to be a secondary school. Yes. The mobile phone camera is a wonderful thing when such treasures reveal themselves to you in your passing (the women in the beach shop to this day must wonder what the hell I was doing taking photographs of her wall). My most used texture of all was the teak veneer I used for my DM furniture: part of the reason I love this style is that my parents had loads of it when I was growing up and my mother still owns quite a bit. But the years haven’t been kind to these surfaces (I confess, I played my part in their current grubbiness) and none of it looked good enough to sample for the creation in SL of something I wanted to look brand new. Imagine, then, my excitement when I remembered the rarely used expansion leaf hanging under the centre of my mother’s dining room table and rotated it out to reveal near-virgin quality teak veneer. I felt like a five-year-old at Christmas. I’ve written here before about how immersion in SL can sometimes bring about a heightened sense of awareness of RL detail; to be able to look at a blandly refurbished 60s building a thousand times previously ignored and spot suddenly a glimpse of its original design and aspiration – a miniscule breakthrough of the recent past, blinking through a crack into the future – is a new pleasure I relish and one I would not have if it wasn’t for my building in SL. I enjoy my surroundings more, even if I don’t now rush every time to take pictures of what to everyone else looks like a badly maintained bit of wall. Simply looking and relishing the look is enough. 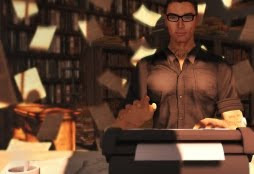 There’s a lot made of building in SL from the perspective of creating saleable content. I, for one, will always maintain support for the notion of a virtual world in which the content is user created: this is one of SL’s defining and most magnificent features. But building is also just fun and everyone should at least dabble in it from time to time. And if the cost of uploading textures puts you off, I feel duty-bound to point out that InWorldz® has an identical building system to SL, except that texture uploads are free. Don’t worry about making something that’s going to earn you millions: just find a sandbox and build something you’d like to build. It’ll make you happier.